"IN THE interval between first entering the gaol and his sentence, a prisoner has probably been before the Police Court two or three times; and his sensibilities are a little blunted, but for all that he feels the day of trial very heavily. In this interval too he has become in a measure acquainted with gaol and gaol doings. He learns much he did not know before, however smart he may have considered himself. He has seen somethings of petty tyranny, but not in its worst form, for there are not enough prisoners, and these that are within the walls are continually changing, and he has gained the advice of the men in ‘billets’ to do his ‘time’ as easy as can be. The sentenced prisoner has one more, initiatory style of degradation to pass through. On getting back to the gaol he is dressed in prison clothes, and shaved. A dull edged razor rasps over his face; a few coarse jokes greet his new appearance, and when he catches a glance of himself in a dilapidated looking glass - dressed in prison clothes, and all moustache and whiskers gone - he realises for the first time he is a CONVICT. Once more is he shaken by a full sense of his position, and once more is he prompted to appeal to an All Powerful Friend for aid to carry him through the long months of his sentence; but the prayer dies on his lips for within the walls there is no prayer, no religion no hope. He joins the rest of the sentenced men in the ‘wood yard,’ and is rushed at once into new acquaintances. He shudders as he looks at them. There is a man with 15 years; two for a brutally murderous assault; there a blackfellow for some hideous piece of filthiness: there are horsestealers, and forgers, and embezzlers, and men for crimes of violence, and a good array of larrikins. And they crowd round him, and ask him questions which seem an awful impertinence; but in what is he better than they. If he is ‘sulky,’ and won’t open out, he is rapidly informed that he is only a ‘ --- lag, ‘and had better mind what he's about. With locking-up comes a respite from these at least, and when he rises next morning there is a gleam of hope within him as he thinks he knows what he has to do; and that he is not there for ever. By the end of the day he has changed his opinion. He thinks he will never live through it, and beating his head against the wall, prays for death. In the old days it was very bad, say the walls, but now the chances are that in the course of a day or two he hears he is on the list for the ‘Island.’ There are 8 or 10 besides himself. On the morning of his departure if he has more than 12 months to serve, he is dressed in gaol clothes, if 12 months or less, in his own. He passes with another man ‘between the gates,’ and sees a length of chain lying on the ground, and two armed constables trifling, with several pairs of hand cuffs. The sharp click of the handcuff ls heard, and he is harnessed to the chain like a bullock in a team, and his mate abreast of him on the other side. In pairs they are thus harnessed up, the constable in charge receives the necessary documents from the chief warder, the word to march is given, and the wretched gang face the streets - with their gaping passers to and fro makes its way to the steamer which is to convey them to the ultimate destination where their sentences are to be carried out. Arrived there, the first course to be undergone is ‘probation,' which simply means that for so many weeks or months the prisoner passes 23 out of 24 hours in his, cell, at first with the door closed, when he is given various kinds of work to perform, afterwards with the door open. His ration is of the poorest. Having completed his ‘probation’ - which usually reduces him very much, and renders him amenable to discipline - he goes into the yard with the others, and on the sort of man he is depends the hard labor he is set at. Bad is the best which gaol affords, for even the billetted man is but a prisoner, and cannot drag himself clear of the contaminating influences with which gaol life is surrounded. He has to put up with every indignity, to touch his hat, and ‘Sir’ men, one or two of whom he wouldn't look at ‘outside,’ but who are his masters, and ready to let him know it, and he gets morose; he falls into gaol ways, thinks it a crime not to steal whenever chance puts it in his way, if it is only a potato, and before he has done six months' hard labor thoroughly comes down to what prison life is - the warders watch you, and you watch the warders. The week's hard labor closes at 12 o'clock on Saturday. After dinner a general personal cleansing takes place; the bath goes all the afternoon; if a man exhibits a dislike to cold water (or perhaps it may be no more than that he does not like stripping in the bath-house before so many men, and so tries to get. out of it) he is ‘bathed’ by some of the other prisoners, who tumble him clothes and all into one of the troughs. About three o'clock on Saturday afternoon the ‘indulgence’ rations are dealt out. 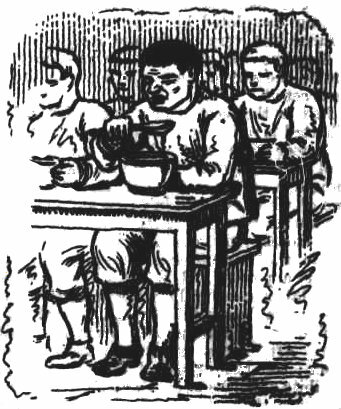 It is only good conduct prisoners who receive indulgence rations, which consists of 2 ounces of tobacco, 3½ ounces of tea, 21 ounces of sugar, and a box of matches. The matches are issued only once a fortnight, the rest is weekly. Kissing goes by favor. So do indulgences. The men who receive them are put on the list by the gaoler who also takes them off for any breach of rules or discipline, indulgences are highly appreciated by the prisoners, but the list often gets a good many on it and when this is the case the favor decreases in proportion. Immediately these rations are served out all hands set to work smoking - those that have tobacco usually being ready to ‘part’ a smoke for once in the week to those who have not got any ‘weed.’ At the head of that indulgence list you will probably see two names - Kimboo and Keelah* - both criminal lunatics. Look at the latter first. He is a kanaka, and quite imbecile. This lunatic is a ‘lifer’ for murder, and has been there 10 years. The other lunatic there, also a ‘lifer’ for murder, and who has killed another man since he has been in gaol, and violently assaulted one or two more, has been 22 years within the walls. He is a chinaman; an exceptionally clean and rather pleasant looking specimen too. He usually has a yard to himself, because he is dangerous when annoyed, and it need not be said that the many larrikins, who are so continually in and out, would do their best to annoy him provided their new skins stood no chance of being burnt. But then your larrikin is the greatest cur in creation. The determined attitude of a small boy of 12 would cow a great big hulking youth of 20. These two prisoners are most carefully looked after. It would break what does duty for the chief warder's heart if anything happened to Kimboo." 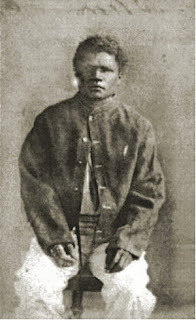 * Kelah was a South Sea Islander who was sentenced to death for murder in 1874 but had his sentence commutated. He served time in Petrie Terrace prison, and St Helena Island, and also the Woogaroo Lunatic Asylum (as it was then known). While he was at Petrie Terrace in 1882 he refused to eat and eventually died of ‘atrophy’ in June of that year. His story features in the book Prisoners of Toowong Cemetery: Life and Death in the Old Petrie Terrace Gaol.